More than 60 drawings by the iconic American artist are shown in Bill Traylor: Drawings from the Collections of the High Museum of Art and the Montgomery Museum of Fine Arts. Until September 12, 2013. Wide Open Arts has announced the inaugural edition of the Outsider Art Fair in Paris, France. October 24 – 27, 2013 at Hotel Le A.
Halle Saint Pierre celebrates 25 years of Raw Vision. Featuring classical works of Art Brut, new discoveries, photos of extraordinary visionary environments and over 60 artists. September 18, 2013 – August 22, 2014. A mutoid community in Santarcangelo di Romagna faces the possible demolition of Mutonia, with its monumental artworks made form large scale scrap metal, as a result of new anti-traveller policies and planning laws. Eye-contacts explores how we can see ourselves in others. With works by Hans Weder, Berta Balzli, Walter Casanova, Manuel Müller and Otto Gilli. August 27 – November 17, 2013. Human, Soul & Machine: The Coming Singularity! 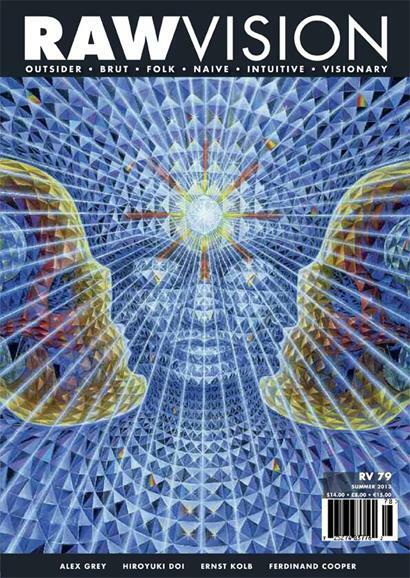 examines the impact of technology on our lives, as seen through the eyes of more than 40 visionary artists. October 5, 2013 – August 31, 2014. Also at AVAM until January 12, 2014, Frank Bruno: A Life Devoted to The End features fourteen masterworks. Art in the Asylum: Creativity and the Evolution of Psychiatry traces the key role that artistic endeavour has played in psychiatric settings from the 1800s to the 1960s. September 7 – November 3, 2013. Nuala Ernest introduces a new book, Net of Being, which celebrates visionary artist Alex Grey's life, art and ethos. Includes an insightful extract. Peter Bolliger and Rolf Bergmann present the work of a new discovery, Ernst Kolb, a German baker who taught himself to draw while hospitalised with diabetes. Rebecca Dimling Cochran shows us the magical world of Ferdinand Cooper, a Southern post-war recluse who carved wood and hammered tin into unusable imitations of objects. Tony Gammidge explores how Patrick Joyce realises his peripheral visions of a mythological world through his bright, colourful paintings and drawings. Ferdinand Altnöder shares the intense paintings of Josef Karl Rädler, a master porcelain painter who was committed to an asylum and intrigued Leo Navratil. Edward Gomez discusses the work of chef-turned-artist Hiroyuki Doi, who creates voluminous compositions made up of little more than thousands of miniscule circles. Victoria Tischler looks at the development of art in British mental health institutions since the 1800s, which is explored in a new exhibition at Djanogly Gallery. Obituaries include Sam Farber, Vollis Simpson and Jo Demarco. Exhibition reviews include the 55th Venice Biennale, Charles Steffen at Collection de l'Art Brut, and Hayward Gallery's Alternative Guide to the Universe. Book reviews include Wölfli: Creator of the Universe by Manuel Anceau and Daniel Baumann (ed. Terezie Zemánková) and Soul of Science by Daniel Martin Diaz. Raw Vision magazine has been publishing for nearly 25 years and remains the world's only international journal of outsider art: art created by untrained artists that is pure, exciting and raw, with real meaning and integrity. Subscribe to our high quality quarterly publication via our webshop.